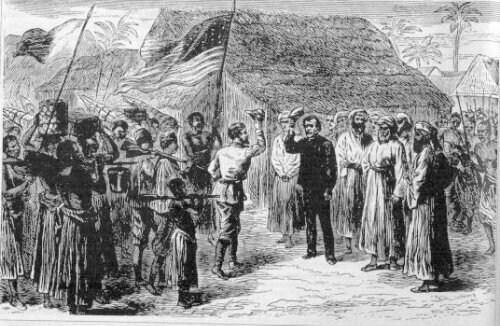 Henry Morton Stanley was famously the journalist who “found” the missionary explorer David Livingstone. He is a classic subject for the debunking-a-Victorian-hero genre, because – if Bierman is to be believed – Morton was a compulsive liar, a storyteller who invented versions of his life to suit his purposes. I’m only part-way through the book, but want to offer some initial reactions to its first part, “Self-Invented Man”. The book was a serendipitous find in a booksale; I was only vaguely aware of Stanley as a historical figure, but I am fascinated by the possibilities of Victorian biography. It exists outside the lifespan of anyone alive today (bar the handful of people born before 1900), so it is an archival genre of biography, yet it almost feels in touching distance: the world of the Victorians was a world my grandparents were familiar with, even if they didn’t directly live in it. Bierman writes well, with requisite wit. He has just the right tone to write Stanley’s story. He has also chosen a fascinating subject. The gift Stanley left his biographer was an autobiography and other writings which are demonstrably false. Early sections of Bierman’s biography read as an extended commentary on Stanley’s autobiography. A key passage of Stanley’s account is presented and then debunked. As one example, Stanley presents himself as a youthful hero in the children’s workhouse, standing up to the tyrannical master, a rebel campaigning for justice. Bierman finds a contradiction in Stanley’s own account – why, then, was Stanley left in charge of the other children when the master was away? – and deploys corroborating evidence (interviews with other inmates, the workhouse records themselves) to argue the reality was that Stanley was actually the teacher’s pet. Unlike a biography I recently finished (that of South Australian author, Matilda Evans) Bierman has a wealth of material to work with, and I find the debunking process gripping. The contradictions and fabrications in Stanley’s account reveal so much about the subject’s character and the age in which he lived.